Crook assumed command of the Department of the Platte, headquartered in Omaha, in May, 1875, at a time when the Teton Sioux were threatening war over the Black Hills, The Fort Laramie Treaty of 1868 had secured this tract to them, but the discovery of gold in 1874 had produced a full-scale invasion by whites. Complaints filed by white trespassers as well as by peaceful tribes along the Upper Missouri led the Indian Bureau to demand return of free-roaming Sioux to their agencies in Dakota Territory and Nebraska. Allied with these groups were segments of the Northern Cheyennes and the Northern Arapahos. In 1876, Crook was part of a coordinated attack designed to drive the defiant Lakota bands gathered around Sitting Bull back onto their reservations. When few complied with government instructions to return to the agencies in early 1876, the War Department ordered troops to bring them in. In this campaign Crook’s troops were forced to retreat from Lakota and Cheyenne warriors led by Crazy Horse in a battle at Rosebud Creek, a defeat that denied reinforcements to George Custer and may have contributed to his devastating loss at the Battle of the Little Bighorn. Ragged and almost starving out of rations, out at elbows and every other exposed angle. Out of everything but pluck and ammunition, Gen. Crook gave up the pursuit of Sitting Bull at the head of Heart River. The Indians had scattered in every direction. We had chased them a month and were no nearer than when we started. Their trail led in as many different directions as there are degrees in the circle. They had burned off the grass from the Yellowstone to the mountains, and our horses were dropping by scores, starved and exhausted, every day we marched. There was no help for it, and the only one thing left to do. At daybreak the next morning the orders came, ‘Make for the Black Hills–due south by compass–seven days march at least’, and we headed our dejected steeds accordingly and shambled off in search of supplies. Through eleven days of pouring rain, pitiless rain we plodded on that never-to-be-forgotten trip, and when at last we sighted Bare [Bear] Butte and halted, exhausted, at the swift-flowing current of the Belle Fourche, three-fourths of our cavalry, of the Second, Third and Fifth regiments, had made the last days’ march afoot. One-half our horses were broken down for good, one-fourth had fallen, never to rise again, and dozens had been eaten to keep us, their riders, alive. 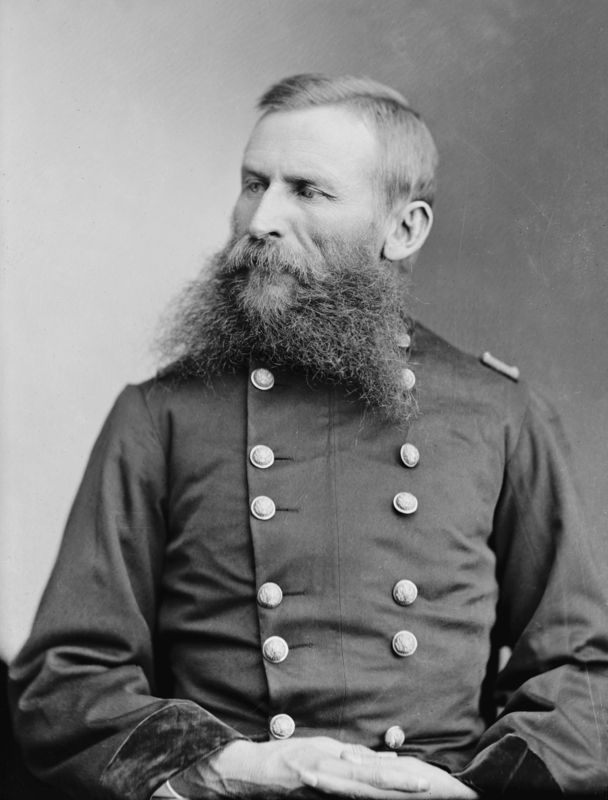 Colonel George M. Sliney related the following of Crook’s march to the Black Hills. We walked 40 minutes and rode 20 in each hour. The doughboys had way the best of it. When we got to camp, we had all horses to guard and to take care of. On September 8, the command laid over one day, and selected the equivalent of four troops of the best horses of the whole command. The four provisional troops was placed under the command of Colonel Mills and at dark that evening he proceeded with the pack train toward the Black Hills for rations.